For its second year, League 97 will again finish the season with a championship event. This year's League 97 Championship will closely resemble last year's event. Sign ups for the championship event will open in early November and battling will start near the end of the month. Like the year before, the championship is split into both a preliminary qualifier and a playoff bracket. Top performers from the first four L97 tournaments of 2014 receive an automatic invitation to the playoff bracket, while all other players are welcome to compete in the preliminary qualifier for an invite to the playoff bracket. The top 20 players will compete in the bracket for the championship! Read closely as details for all players can be found on this page. ***Please be sure to take note of all RED text on this page!! This tournament uses standard L97 rules. Please familiarize yourself with the League 97 rules by clicking here. ***Due to poor attendance numbers, this event's format has been revamped. Please be sure to read all RED text on this page. You may ignore anything that has been crossed out. The event format has been revamped to ensure a small but enjoyable tournament for those participating. The Scrimmage replaces the Preliminary Qualifier and the the Automatic Qualifier Scrimmage. All battlers will be provided a "schedule" or "list" of roughly six opponents to battle. These match-ups will be three battles each. The schedules will be partially random, partially by design in an effort to ensure that all battlers will have mostly similar-strength opponents. By doing so, the playoff committee will have numerous head-to-head match-ups to use in deciding how to rank the field. All participants should be aware that they must complete at least one of their assigned sets during the Qualifier to avoid being dropped from the event. Qualifier match-ups will be posted once signups for the event close. Players that have finished in the top eight of an official 2014 L97 event automatically qualify for the playoff bracket, provided they sign up for the event. 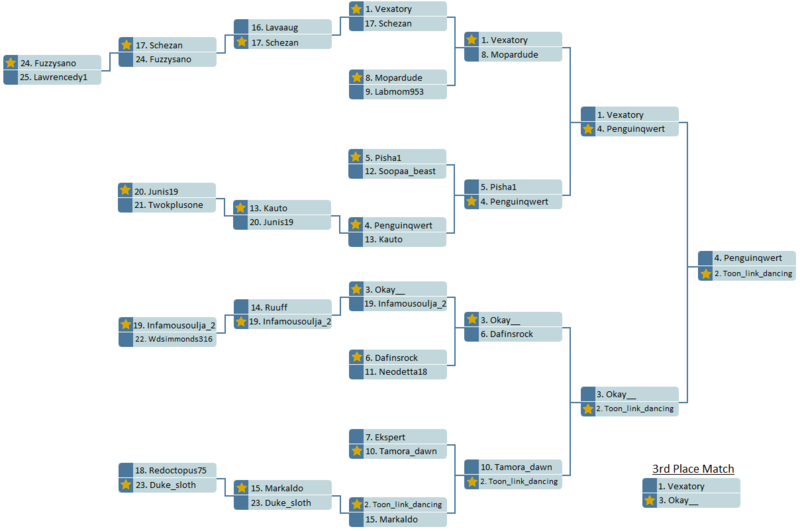 Players that automatically qualify for the championship playoff bracket are listed in the table below. Player that automatically qualify for the playoff bracket are welcome to participate in the Automatic Qualifer Scrimmage (AQ Scrimmage). 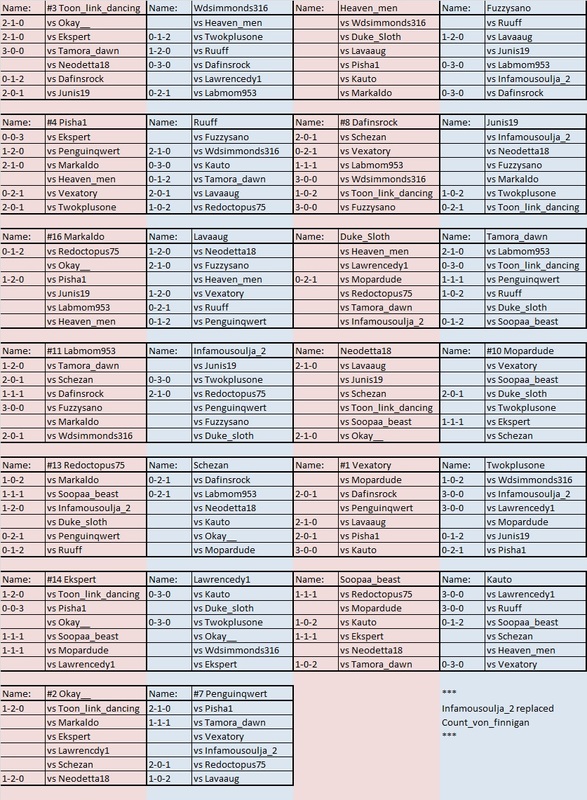 The AQ Scrimmage is a pool consisting of the automatic qualifiers that will factor in the seeding of the playoff field. Since automatic qualifiers are guaranteed a place in the playoff bracket, they may opt out of the AQ Scrimmage by mailing Penguinqwert. Automatic qualifiers with small resumes could face a drop in seeding for opting out of the AQ Scrimmage (See next section). Like the Preliminary Qualifier, players in the AQ Scrimmage will battle each other exactly three times. Battlers that have completed at least one of their Scrimmage sets are invited to the Playoff Bracket. Battlers that have not finished any sets will be considered absent and will not be placed in the Playoff Bracket. Once the Preliminary Qualifier and AQ Scrimmage come to a close, the playoff committee will assign a seed to each player that earned a spot in the playoff bracket. Each member of the playoff committee will produce an individual ordering based on merit. Playoff committee members will consider performance in the Preliminary Qualifier and the AQ Scrimmage as well as performance in past (iDB) L97 events. After every committee member has produced an ordering, each player's highest and lowest ranking will be dropped. The remaining four rankings will be averaged and players will be seeded by this average. Only in the event of a tie in ranking will all six rankings be averaged. Any further tie in ranking will be decided by the tied party's most recent head-to-head match-up (excluding ties). If no decisive match-ups between the tied party's exists, the player with the higher career win percentage will be seeded ahead of the player with the lower career win percentage. Any further tie would be decided by a coin flip. The members of the 2014 playoff committee are listed in the table below. The playoff bracket will be made available once the playoff committee has seeded the field. The playoff bracket is single elimination, best-two-of-three battles. A third battle is unnecessary should a player win the first two battles of a match-up. Players that are tied after three battles will continue to battle until a player wins a battle to break the tie. Players that lose a match-up are eliminated from the event, however, the two players that lose in the semi-finals will be paired to distinguish third and fourth place. The playoff bracket will contain 20 spots, however, the playoff structure is subject to change to accommodate a large turnout. The table below lists the number of playoff spots as determined by number of signups. iDB currently expects a turnout as described by the first row. Seed Name I II III IV V VI Avg. Trophies will be awarded for 1st, 2nd, 3rd, and 4th place. Participation medals will be made available for all players who complete a battle, and Qualifier medals will be awarded to all 20 players to earn a spot in the bracket. In addition, medals will be awarded for winning the qualifier pool(s). Under the revamped format, an Outstanding Scrimmage Performance medal will be awarded by the tournament committee. This medal will replace qualifier pool trophies. This page was last updated on January 10, 2015.